In the book of Ephesians, Paul emphasized (as he always seemed to do) that the Gospel of Jesus Christ was not a new idea. Everything Jesus accomplished was part of God’s plan since “before the foundation of the world.” But there was one thing that was surprising about the Gospel, one thing that had been a secret or a “mystery” before, but now was revealed by the Gospel. What was that “mystery”? What had God’s people not expected the Messiah to bring about? 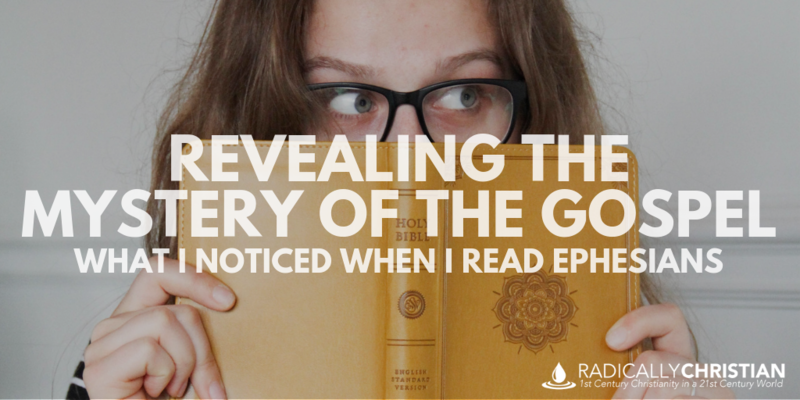 What was surprising about the Gospel? Paul answers that question in Ephesians. What Do You Think the Mystery Is? I’ve always assumed the mystery was something like this: Prior to Jesus, the Jews expected a physical kingdom. They thought the Messiah would come and give them the land back (as the prophets all seemed to say) and the Jews would live happily under the Messiah’s reign forever. However, Jesus died and was raised so they could be part of a spiritual kingdom and go up to heaven someday to live with God. I always thought the mystery was that the Jews were expecting something “physical,” but God had in mind something “spiritual.” I thought the mystery was that all of the “physical” things in the Old Testament were just pointing forward to “spiritual” things in the New Testament. I tried to read the whole Bible with this sort of typology mentality until I realized I was overcomplicating the story and misreading everything. So, take just a second and ask yourself: What is the mystery? What is the thing that was hidden from God’s people before Jesus came and revealed God’s master plan? The mystery that was hidden in previous generations, but came to light in Christ, was that the people of God who would “acquire possession” of the promised inheritance would be made up of both Jews and Gentiles. That is the thing the Jews did not expect. That is the part of God’s master plan that was so surprising. The first three chapters of Ephesians are spent describing in great detail the glorious blessings that Gentile Christians have received. Paul reminded them that, prior to Christ, they were “dead in their sins and trespasses.” Obviously, they were not dead in a medical sense, so we ought to ask ourselves in what sense they were dead. Many say, as I have often said before, “Paul means they were ‘spiritually dead.’” But as far as I know, the word “spiritually” is never used in Scripture to describe death. A person can be “spiritually alive” when the Spirit of God dwells within them, but there is no place in Scripture that speaks of being “spiritually dead.” It is as nonsensical as, “Brightly dark.” They are opposite ideas and cannot be paired together in such a way. Therefore, I think it is better to take Paul’s words to mean that before Christ, the Ephesians were “condemned” in their sins. Death had a claim on them. Before Christ, they would have died without any hope of being raised to immortality. They were dead in the same way Adam and Eve died the day they ate the fruit in the Garden of Eden; driven away from the tree of life, condemned to death. In addition to the language about being dead and now being alive, Paul also uses all kinds of language that makes one think of royalty. These Gentile Christians, by putting their faith in Jesus, had become part of the ruling class. They had been exalted to seats in the “heavenly places” with Jesus. This isn’t just part of the future promise, but part of their present reality as Paul is writing them this letter. This royalty language soon gives way to temple language as Paul describes how they are the temple of God where the Holy Spirit dwells. The first three chapters set the stage for the final chapters of Ephesians. In chapter four, Paul transitions from, These are the blessings of being part of God’s royal family, and transitions to, Since you’re part of God’s royal family, here is how you must live. These Gentiles are actually not Gentiles anymore. They are now part of the new Israel, the new creation, and they must live like it. Applying Ephesians to our lives, if we want to be part of the new Israel, the new creation, we also must “walk in a manner worthy of the calling to which you have been called.” If we are in Christ, we are no longer Gentiles, we are part of God’s royal family. We must live like new creation people if we hope to one day “acquire possession” of the inheritance God has promised to his people.